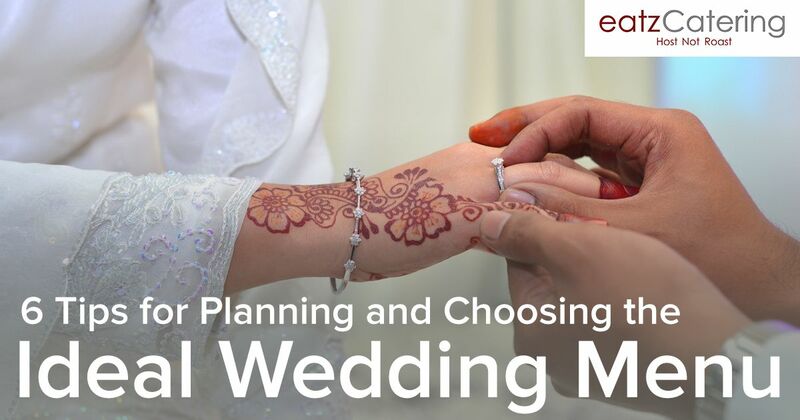 Choosing the right wedding catering Singapore company is just the first part of the process. Once you do, you’ll have to make up your mind about the ideal menu. Your wedding is one of the most special days and you probably want everything to be immaculate. Choosing suitable food, however, isn’t going to be an easy task. Even if you have a small wedding party, it will still be attended by dozens of people. Addressing everybody ‘s tastes and preferences will be impossible. Getting the right catering Singapore service provider involved in the process will give you some know-how and a couple of good ideas you can utilise to fine tune the menu concept. If you’re in need of some additional assistance, follow these menu planning suggestions. 1. What Will the Service Style Be? The first question you have to answer before moving on to any other consideration revolves around the service style. Will there be a seated arrangement and a three-course menu that you’ll serve to the reception guests? Will there be a wedding buffet enabling people to make a choice and try an array of different delicious foods? Or maybe you want to make the food a bit more attractive by having a live station at the venue? The style of service will be determining for all other aspects of menu selection. A seated dinner is more formal and sophisticated. Buffet-style food offerings ensure a higher level of interactivity and a bigger number of choices. There’s no right or wrong choice here. Think about the nature of the venue, the wedding theme and the types of guests you’ve invited. These considerations will help you choose the style of culinary service that’s best suited to the occasion. While many couples focus on their guests for the wedding reception planning, you have to remember this is your special day. A bespoke menu should be crafted to address your preferences and the likes of your partner. The two of you should work together with the event caterer, making sure you have access to some of your biggest favourites. Most reputable Singapore caterers will do their best to accommodate for the needs of the happy couple. Don’t be afraid to ask for something special, even if you don’t see it on the menu. Chances are that your wishes will be respected. While you should definitely focus on your preferences, it’s a good idea to accommodate for special needs that your reception attendees may have. Are there vegetarians among your guests? If so, your catering should feature at least a few delicious vegetarian options. In multicultural Singapore where surely many of your guests or yourselves are Muslim, it is always good to go with a caterer who is Halal-certified. It’s also a good idea to inquire about food allergies and to let your guests know what your caterer can or cannot provide. Other than that, you’re free to look for diversity and richness in your wedding day menu. If you’re going to have choices for each meal, opt for plates that are quite different from each other. This kind of diversity will give everyone something to enjoy. Narrowing things down can be very difficult when you want abundance and a good menu choice for your wedding. One of the simplest way to reduce the number of possibilities you’ll have to consider is by selecting the budget in advance. How much are you willing to spend on your wedding day catering? When you share this type of information with your catering service provider, you’ll get a list of options that fall within the respective price range. You should also inquire about eventual additional costs. Get a written quote from your catering service provider. The quote should outline everything included in the package and whether there are additional fees or charges. Strive for full transparency and if you’re not getting it, consider a change of the service provider. The quality of wedding food will be heavily dependent on the quality of the ingredients and the experience of the chef. The best and freshest ingredients are seasonal picks. These are grown locally, they’re more sustainable, more affordable and usually – much more delicious than stuff that has been imported from a faraway location. Catering companies typically have at least a few seasonal choices in their menu selection. If you don’t know which ingredients are best right now, schedule a preliminary consultation to go over the options. Very often, this first encounter will also feature a tasting, giving you an even better idea about what you’ll be dealing with. International buffets are always a safe and delicious pick. The menu selection, however, could be used to pay homage to your heritage. Your distinctive cultural background is probably heavily connected to a certain type of food – the food your mom and your grandma used to make. What could be more personal and emotional than creating a culturally-inspired menu for your wedding? A fusion Asian buffet is an excellent example of a menu that is culturally-inspired but that also takes the traditional concept to the next level. Whichever approach you opt for, make sure you have the support of the right Singapore caterer. Even if you have the perfect wedding menu concept, it will not come to fruition in the absence of an experienced food preparation team. Take some time to explore different offers, compare menus and identify the Singapore caterers that have the experience and the vision to bring special food to your wedding day. Companies like Eatz Catering will definitely deliver. We have specialized wedding day menus and we can work to accommodate for your individual preferences. Contact us today to get started.